Does sleep feel elusive? Breathe your way to bliss. Is there anything more frustrating than settling in bed with the intention of getting a solid evening’s rest, and then battling to fall asleep? It’s like your own body is actively working against you. Plus, when you start worrying about falling asleep, you’re not exactly setting the mood for restful slumber either. So what is a sleep-deprived individual to do? Get a prescription for sleeping pills? Go for hypnosis? Get ready for bed, and sit down on your bed with your back straight and your head slightly forward. Now focus on your breath. You are going to inhale and exhale mindfully five times in a row. On the first round, you will inhale and exhale for one count each; then for two counts; three counts; up to five counts. Then start over again. All in all you will be meditating for ten minutes, instead of focusing on the anxiety of lying awake. Shallow breathing is a big reason for modern-day stress and anxiety. When we breathe through our mouths we become anxious. Nasal breathing is the first step towards relaxation. Sit up in your bed with a neutral spine. Gently hold your one nostril closed with a finger and breathe in through the other one. 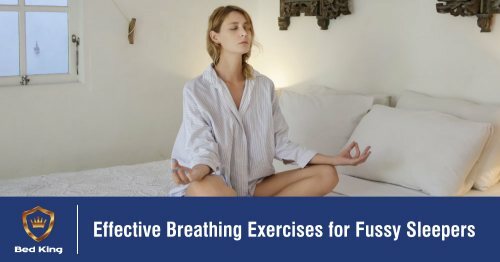 On the exhale, switch nostrils, breathing out of the first, and gently blocking the second. Oxygen is essential to our survival as a species. Lie on your back and inhale, all the while envisioning the air molecules travelling through your nasal cavity to the rest of your body, feeding your muscles and organs, making its ways to the extremities of your fingers and toes, and then travelling all the way back out again once it's usefulness has been expended. This type of visualisation engages your parasympathetic system, which lowers your heart rate to prepare your body for sleep. Practice these breathing exercises regularly and you are bound to have a much easier time falling asleep when you hit the hay at night. Keep an eye on the blog in coming weeks and months as we share more expert advice on this subject. In the meantime, you are invited to become a part of our #SleepRevolution. Sign up for the Bed King Sleep Challenge to stand a chance to WIN up to R20 000 in prizes. Competition valid from 5 January - 16 February 2019. Ts & Cs apply!